I’ve long been a fan of paper mache and the beautiful, whimsical creations that arise from it, but have never been able to sit down and make something out of it for myself. 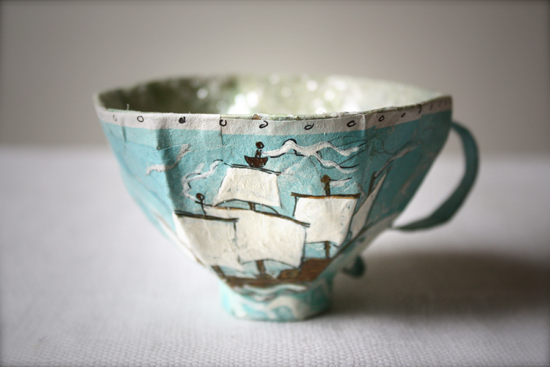 However, upon finding this helpful tutorial and gorgeous photos from Ann Wood, I might just have to make some time and put some of these delicate cups together for my next tea party. If you’re new to paper mache, it is quite a forgiving medium. Nothing has to be perfect. You work at your own pace. And the materials are cheap. It’s a great skill to learn for 3-D art, and there’s plenty of inspiration to find online, particularly on Pinterest. I’ve pinned a few dozen paper mache projects (including animals, dollhouse furniture, and jewelry) and am looking forward to giving this craft a go. 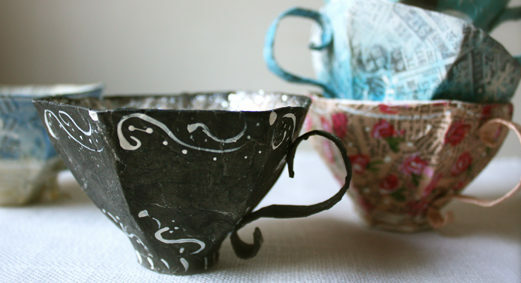 Whether you’re an old hat at this or are beginning your journey into paper mache, these teacups are a great project. There’s a template available from Ann Wood, along with a written tutorial and plenty of photos for the step-by-step process. To make your own teacup (or set), you’ll need the following materials: a template, paste (Ann recommends wallpaper paste), cardboard (thin like cereal and cracker boxes as well as thicker pieces from pizza boxes or Amazon packages), newspaper, scotch tape (invisible isn’t necessary), glue, a pencil, an exacto knife, scissors, and whatever you’ll be using to decorate the teacups, such as scrapbook paper, mod podge, magazine clippings, stickers, fabric, ribbon, etc. Once you’ve gathered the materials, you’ll need a large, clean work space. Remember to wear older clothes that you don’t mind getting messy. Paper mache is for people who like to work with their hands and enjoy getting them dirty. 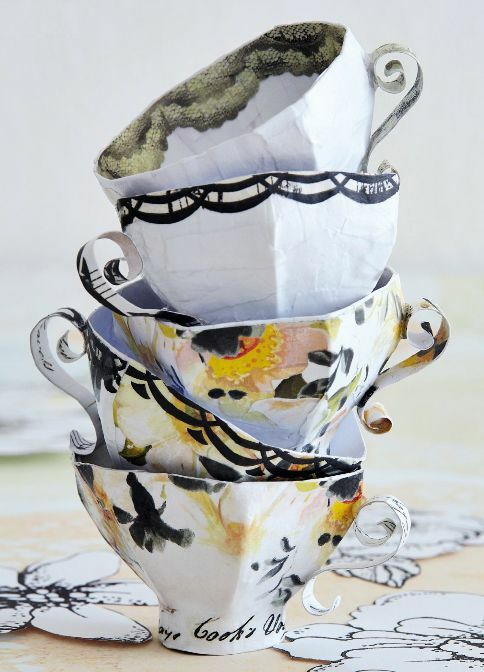 Use the template to cut out your teacup and then slowly turn and tape it into the teacup shape. You can make a handle or not, as you choose. Ann suggests not using paper mache on the handle. 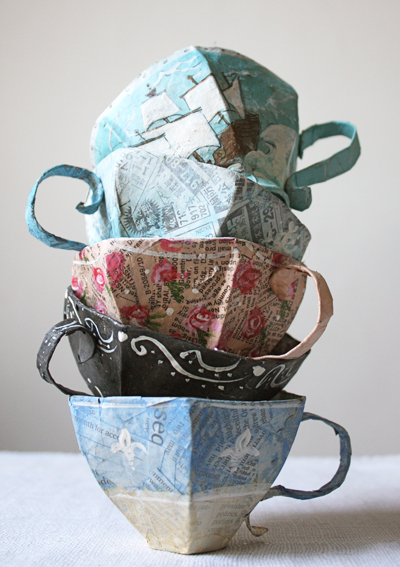 You only need one layer, but if you prefer a chunkier teacup, add a few more. After the paper mache, you can decorate the cup (and add the handle). You can use paint, markers, pastels, whatever suits your fancy. Allow for plenty of drying time between layers, or, if you’re using acrylic, keep some water nearby to refresh your brushes and keep the paint from drying too quickly. What do you do with these teacups? Well, you can use them as a centerpiece for your next tea party, but they can also be used for other things, like a jewelry case (put your earrings or rings inside), a paperweight to hold your paperclips, a tree ornament for the holidays, as containers for your tea bags, or as organizers for your craft notions. There are dozens of ways to utilize these pretty paper cups, and they also make great gifts — just fill with tea, chocolates, or potpourri and you have a present perfect for friends, family members, teachers, and co-workers. If you do end up making one or several of these beauties, Ann would enjoy seeing them! You can upload them to Flickr or leave a link in the comments. You can find all the instructions and photos at Ann Wood’s Handmade site. Happy crafting!